If you enjoy exquisite, especially delicious food, prepared from the highest quality ingredients, delivered with gracious, exceptional service and attention to detail, then Thailand should be your food destination. 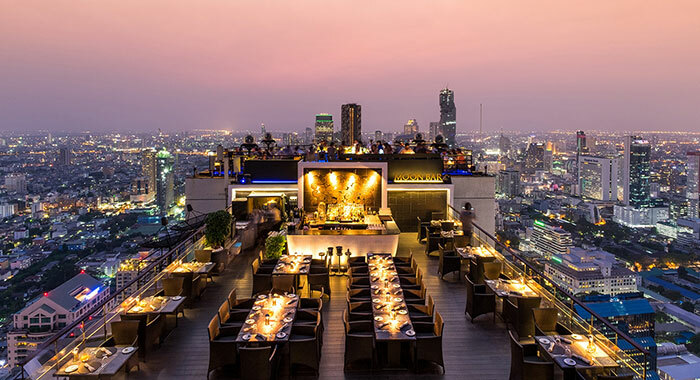 Overlooking Bangkok from a 61st floor, roof top terrace above the Banyan Tree Hotel, Vertigo and Moon Bar are a must visit when in the city. “The view is to die for and it is a peaceful retreat from the craziness that is Bangkok” according to one Destinology Thai traveller. At Vertigo guests can enjoy an al fresco dining experience. Start your evening with a cocktail, we recommend the Vertigo Sunset, aptly named from its beautiful appearance, it is a mix of cranberry, pineapple and lime juice with the perfect amount of rum and Malibu. Sit back and enjoy the 360° city view and peruse the menus. There are a la carte and 3, 4, 5 and 7 course set menus and wine pairing recommendations are made by attentive servers which adds to the dining experience. The food and ingredients are of the highest quality – try the Chateaubriand steak or the Miyazaki Wagyu Tenderloin if you love meat, for fish lovers the Iced Fisherman Tower is the perfect option it includes Oysters, Caviar and Lobster and if you are vegetarian, like many of our explorers, there is a gorgeous Salted – Baked Golden Beets dish - a food combination of dizzying heights – excuse the pun! Feeling romantic? 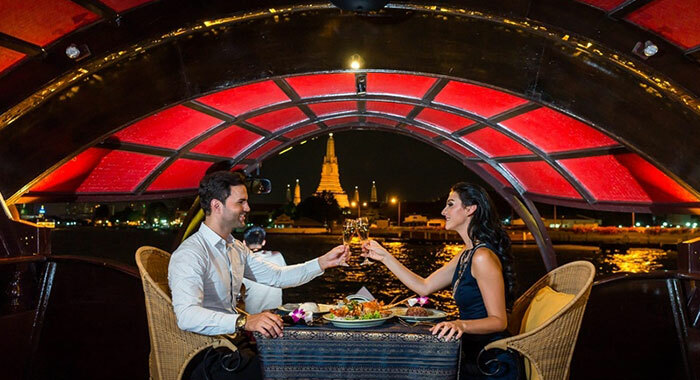 Take an evening cruise along the Chao Phraya River the ‘River of Kings’ and, if you can take your eyes away from the one you love, enjoy the glittering sights of Bangkok, including the illuminated Temple of Dawn and Grand Palace. 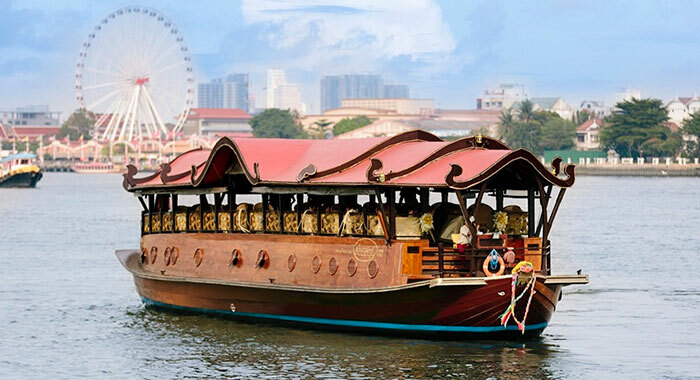 Board a luxury Manhora rice barge that has been converted into one of Bangkok’s finest dining locations and enjoy a sumptuous five-course dinner that includes a traditional starter, Thai appetisers, soup, a family main course and desserts. We loved the Thod Mun Goong appetiser – a deep fried prawn cake served with prawn paste, pork lard, sesame oil, egg and a sweet tom yam sauce. 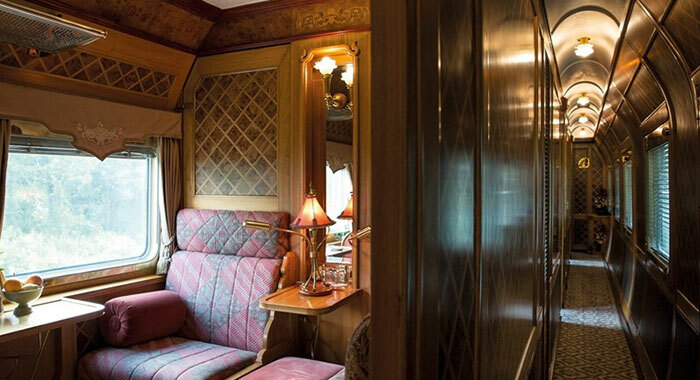 Book this dining experience and you will be picked up from your hotel in Bangkok and delivered to Hua Lamphong Station where you will be served drinks and light snacks before you board the Eastern and Oriental Express. As the iconic train embarks on her journey make your way to the Observation Car for an aperitif and views of the city and sunset. 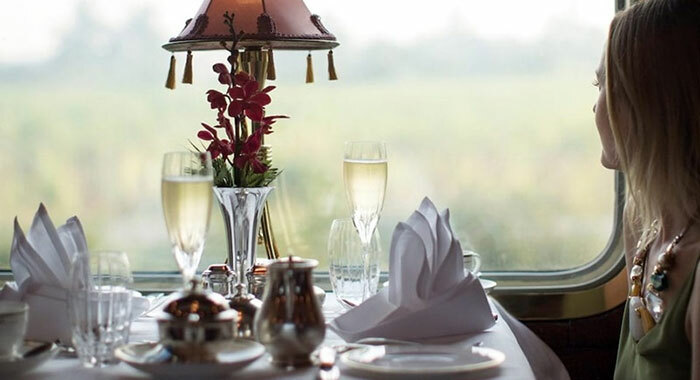 In the Restaurant Car you will be served a 3-course feast of eastern and western specialities paired with perfect wines followed by coffee or tea with petit fours. After dinner drinks are served in the Piano Bar accompanied by music before the evening ends in Kanchanaburi. 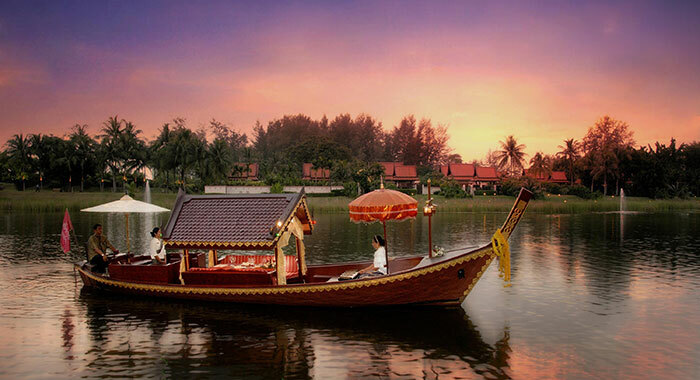 Your tour includes shared transfer return from Kanchanaburi to Mandarin Oriental Hotel, Bangkok. Sirocco is the world’s highest alfresco restaurant and is a fine dining experience that ticks all the boxes in terms of food, wine, ambience and service. The Sky Bar should be your first stop where you will find a fabulous aperitif, be it Perrier Jouet Champagne, a whisky from their extensive selection or a Signature Sunset Cocktail. At Sirocco unobtrusive and knowledgeable staff will accompany you through your dining experience. The Chefs Tasting Menu is paired with champagne and wines from around the world. Sample dishes from the a la carte menu include Line Caught Brittany Sea Bass and Seared Muscovy Duck, the dessert menu might boast a Pineapple Crescendo, and it will be just that – the finale to a food concerto. 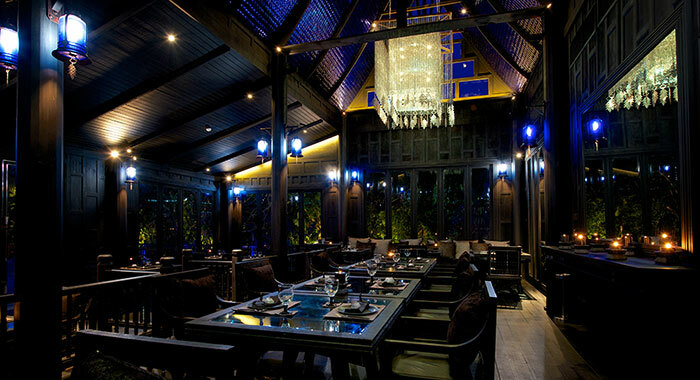 Black Ginger is designed like a traditional mansion and hovers over a lagoon like a modern piece of art. 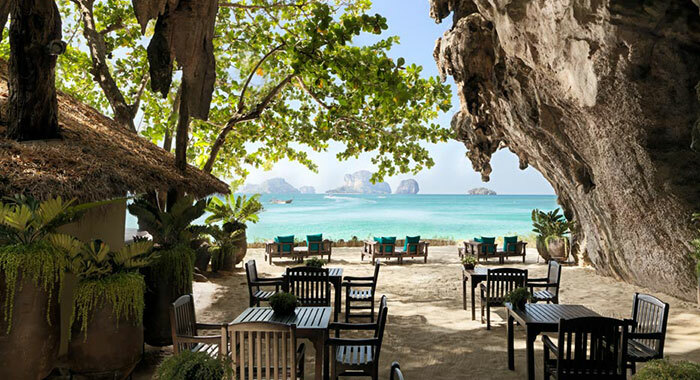 The restaurant celebrates the authenticity of food from the island’s heritage - local recipes are forefront and the Menu is entitled ‘True Tastes of Phuket’ with the emphasis on produce grown on the island. 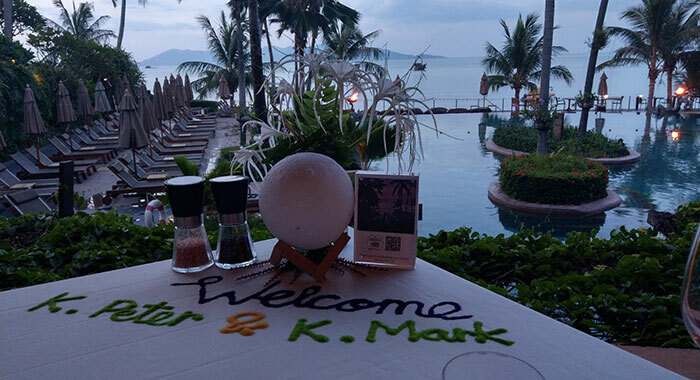 Set sharing menus are not only romantic they ensure you get to taste more of the incredible food combinations. Sample dishes include Yum Dok Dala – finely chopped torch ginger flowers mixed with diced chicken and Thai herbs and Bua Thod – tender shrimps and local ‘cha-plu’ leaves tossed in turmeric batter and served golden and crispy. The dessert we adore is Oh Aeiw – the name itself is fantastic – the dish is Phuketien banana jelly perfumed by magnolia champaka flower syrup, served with palm seeds. 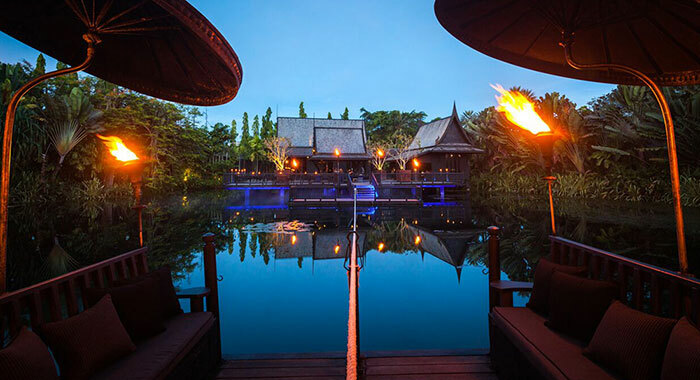 Travel to your floating ‘table for two’, adorned with flowers and candles, on a traditional Thai long boat whilst sipping on a glass of Champagne. Dinner is served by private, gracious waiting staff and each course is brought out by boat having been freshly prepared. 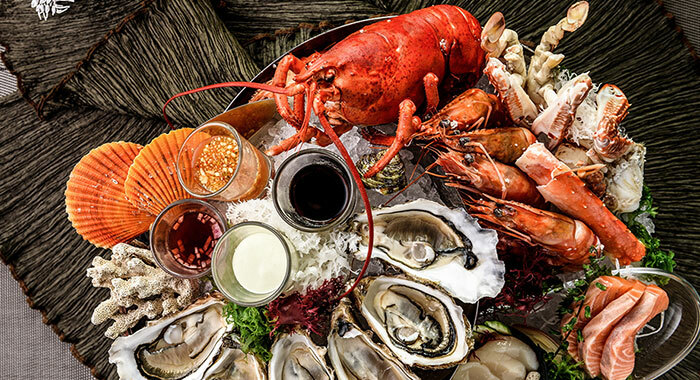 The menu can include oysters, lobster, scallops but a discussion with the chef means it can be tailor made to your culinary tastes. That said, a crepe suzette with Grand Marnier flambe for dessert is a show stopper and a feast for the eyes. 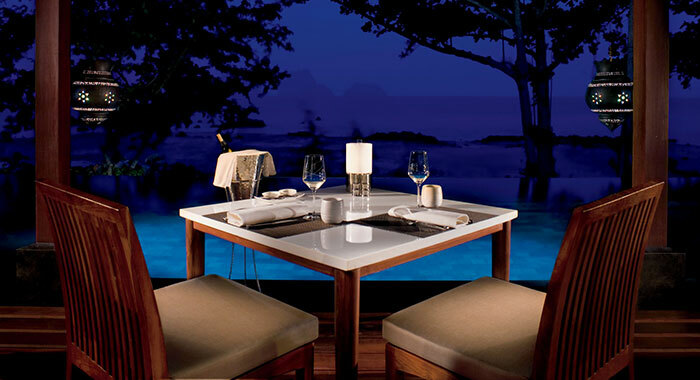 After dinner staff leave you to enjoy the serene location under a myriad of stars alone. 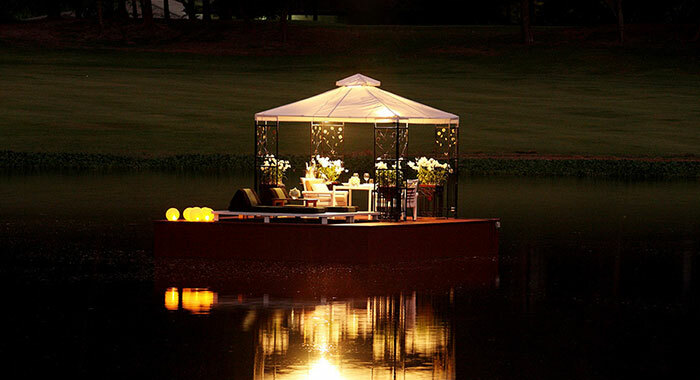 Romantic, inspiring and intimate. Alternatively, you can experience ‘Sanya Rak’ which translates as ‘Promise of Love’ it is the Banyan Tree’s traditional long boat. Accompanied by traditional music you can enjoy Phuket’s spectacular sunset as you sail through the resort’s lagoons and enjoy being wined and dined. Thai dishes are prepared by the Saffron, Phuket resident Chef, Chef Worapong Panchoo, who is a veteran in the Thai kitchen. Dine amongst the tree tops in a private sala and choose French or Mediterranean flavours from a crafted menu that showcases local produce and accompany your meal with a wine pairing made by the resorts Wine Guru. This is a venue and menu that will delight. Mark from Destinology was blown away by his experience. 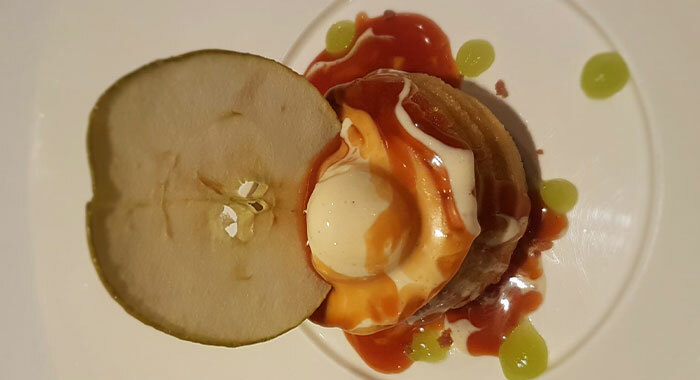 "The attention to detail, myhappiness and comfort and the incredible food flavours all made a night I will treasure." 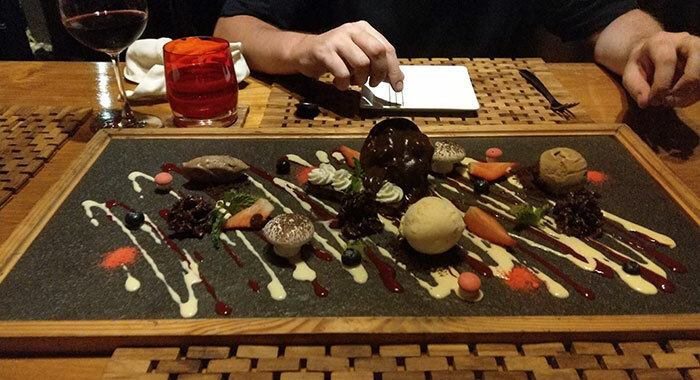 See his images below to be tempted to this food destination. 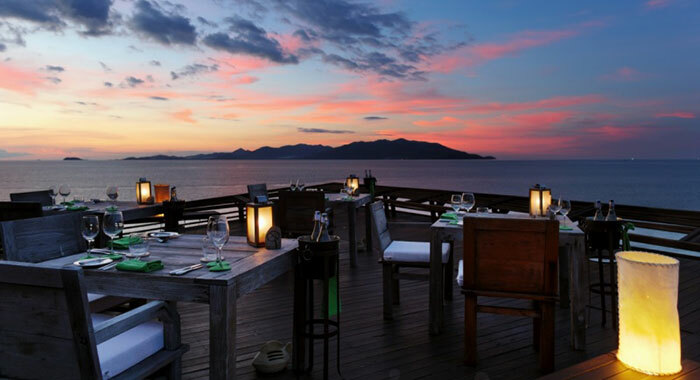 Seafood lovers must visit the Lae Lay Pavilion which overlooks Phulay Bay and serves only 22 covers. The rooftop lounge is the perfect location for a special dining experience – it is secluded, intimate and unforgettable. The restaurant has a sea-to-table philosophy, so it is fine dining, seafood heaven. The starters and mains all have seafood as centre stage and you will only find a token supporting meat accompaniment. 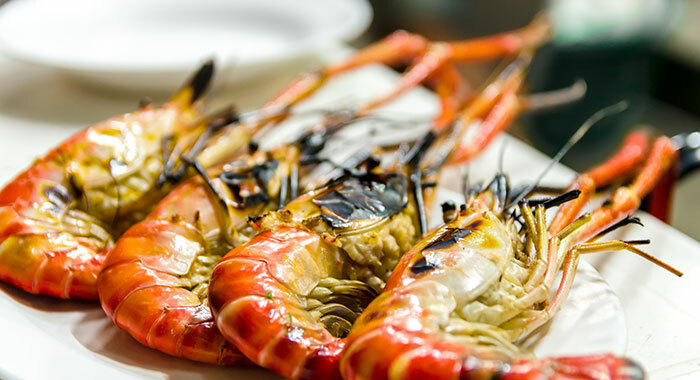 The menu is all about the ingredients; the fresh grilled rock lobster comes with asparagus and a toasted butter cream and the Snow fish is served in a seafood paella with squid. Desserts, you will be pleased to know, are fishless and typical example dishes are vanilla panna cotta, mango, lime and sesame nougatine and Chocolate cappuccino, saffron and coffee. 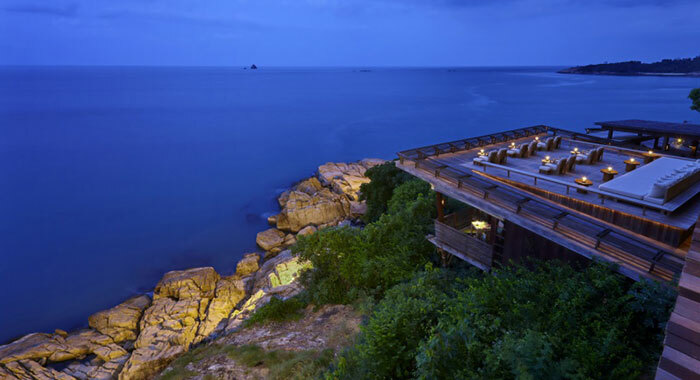 Ten terraced decks offer panoramic ocean backdrops and views at Dining on the Rocks. The restaurant’s believed in imaginative food created from organic and sustainable food, sourced both locally and from across the world. Choose a culinary journey with wine for a dining experience that will stay in your memory forever. An example of the 5 Course Indochine menu pairs Tattinger Cuvee Prestige Brut with Tuna Sashimi, Mud House Pinot Noir from New Zealand with Roast Pork Belly and a 2016 Moscato with Passion Fruit Sorbet and that is just a taster of what is on offer. If you choose Table 99 or 100 (booking required) you are assured of that extra privacy and seclusion a romantic or precious moment deserves. The Grotto is located inside an ancient limestone cave just steps from the Andaman Sea and the Phra Nang sunset. This is not fine dining in the strictest sense of the definition but, the food is glorious, the staff friendly and attentive, the cocktails fruity and delicious and the location romantic, charming and panoramic. 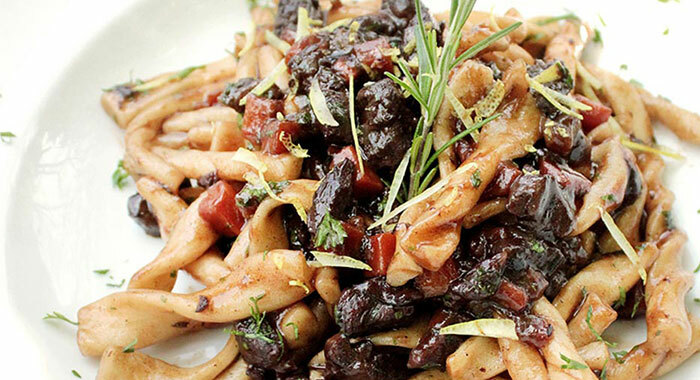 Food is delicious and simple – salads, pasta and noodle dishes created from amazing ingredients and with care. We loved the Phad Thai goong lai suea and the Ivory Chocolate Mousse and roasted pineapple is sumptuous. This is in every sense a dining experience for everyone. Thailand is a foodie destination. Get booking and tasting. There are lots of ways to experience the Thai street food scene. 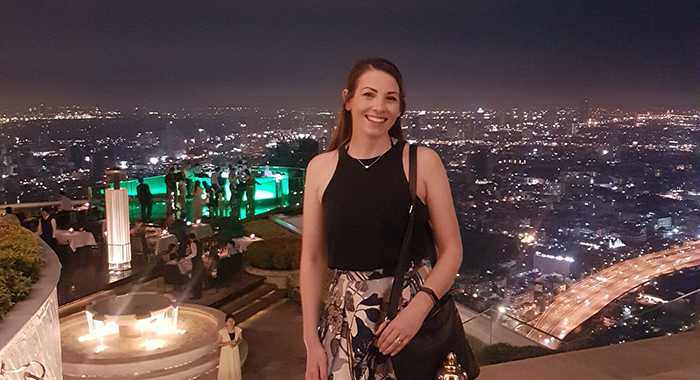 Destinology and its travellers recommend some of the tour options across the country and guides the option of ‘going it alone’.